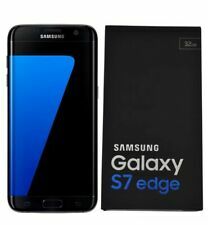 Brand New Boxed Samsung Galaxy S7 Edge G935F 32GB Black Onyx - Unlocked to all networks. Comes boxed with all original sealed accessories such as Cable Wall Plug and Headphones are included. Please note these phones are Samsung replacement obtained under warranty. Therefore these are 100% original. Comes with original box. Phone and box imei won’t match due to the fact that phone was replaced by Samsung. Phone still has protective cellophane on it. Phone may have some Samsung warranty left. However I will offer 6 months seller warranty. 1 x Samsung S7 Edge Unlocked Phone. Phone is in Very Good condition, 100% Original, Unlocked, Full working and tested, 12 Months warranty included. We provide 12 months warranty. which will cover all manufacturer faults. Phone only no accessories are included. 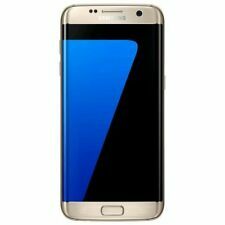 Brand New Boxed Samsung Galaxy S7 Edge G935F 32GB Platinum Gold - Unlocked to all networks. Comes boxed with all original sealed accessories such as Cable Wall Plug and Headphones are included. Please note these phones are Samsung replacement obtained under warranty. Therefore these are 100% original. Comes with original box. Phone and box imei won’t match due to the fact that phone was replaced by Samsung. Phone still has protective cellophane on it. Phone may have some Samsung warranty left. However I will offer 6 months seller warranty. For sale is a Samsung s7 edge. -The battery life is still fine. All other features and functions are in working order. -All the other features work perfectly. The phone will be reset back to factory settings and wiped clean of any personal information. 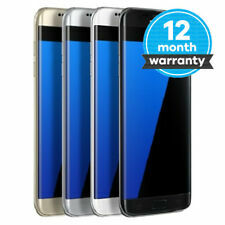 Factory Unlocked/Sealed with Extended 2 Years Warranty! 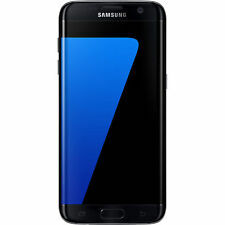 Brand New Boxed Samsung Galaxy S7 Edge G935F 32GB Coral Blue - Unlocked to all networks. Comes boxed with all original sealed accessories such as Cable Wall Plug and Headphones are included. Please note these phones are Samsung replacement obtained under warranty. Therefore these are 100% original. Comes with original box. Phone and box imei won’t match due to the fact that phone was replaced by Samsung. Phone still has protective cellophane on it. Phone may have some Samsung warranty left. However I will offer 6 months seller warranty. Interested?. Scroll on for more information, then scroll right back up and hit the “Buy It Now” button. The dual pixel 12MP sensor can focus as quickly and as seamlessly as the human eye, even when the light starts to fade. 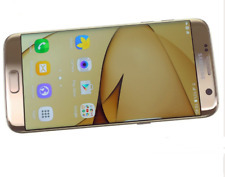 The screen on the phone is cracked but the overall condition of the phone is good condition. Hardly any chips on the side and the back of the phone is in good condition with no cracks. Samsung Galaxy S7 edge SM-G935F - 32GB - Black Onyx (Unlocked) Smartphone. Condition is Used. Dispatched with Royal Mail 1st Class. For sale is a Samsung Galaxy S7 Edge. -The phone will be reset back to factory settings and wiped clean of any personal information. -A generic charging cable is included with the phone. Samsung Galaxy S7 edge SM-G935F - 32GB - Gold Platinum (Unlocked) Smartphone. POOR CONDITION, WORKS PERFECTLY. 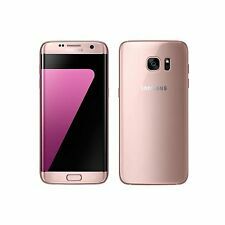 Samsung Galaxy S7 edge SM-G935F - 32GB - Rose Gold (Unlocked) Smartphone. POOR Condition, working perfectly. Samsung Galaxy S7 edge SM-G935F - 32GB - Gold Platinum (Unlocked) Smartphone. Condition is Used. Samsung Galaxy S7 Edge phone SM-G935F 32GB. Sim card slot opener. Rubberised rear cover. I have used this on Vodafone. As we are all on Vodafone, I don't have access to any other sim cards to check if this is unlocked or not. Samsung Galaxy S7 edge SM-G935F - 32GB - Gold Platinum (Unlocked) Smartphone. Condition is Used. Dispatched with Royal Mail 1st Class. Phone is unlocked and in perfect working order. There are 3 hair line cracks in the corners which are barely noticeable - these are purely cosmetic as they are away from the screen and have NO impact on the display at all. No screen burn. Camera works perfect - see last picture uploaded using the front facing camera. Phone comes boxed and factory reset with original headphones (mic does not work on the headphones), original fast charger, USB connector and Griffin Survivor case which was purchased last month. For sale is a Samsung s7 edge. All the other features work perfectly. The phone will be reset back to factory settings and wiped clean of any personal information. -The battery life is still fine. Samsung Galaxy S7 Edge 32gb Smartphone Unlocked in good condition. The S7 Edge is still an amazing handset and is still a great rival to the S8 and S9! Phone, Data Cable & Box ONLY(genuine S7 edge box but may be of a different colour). This phone has been network unlocked so will work with any network. Battery condition will vary depending on previous device usage history. Free 12 Month Warranty Included! Samsung Galaxy S7 edge SM-G935F - 32GB - Gold Platinum (Unlocked) Smartphone. Condition is New. Dispatched with Royal Mail 1st Class. Used Samsung Galaxy S7 Edge. Good condition, small crack to rear glass as shown in photo. Otherwise in full working order. Including Spigen protective case in sale. 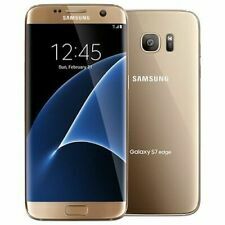 Samsung Galaxy S7 edge SM-G935F - 32GB - Gold Platinum (Unlocked) Smartphone. Condition is Manufacturer refurbished. Dispatched with Royal Mail 1st Class. Samsung Galaxy S7 edge SM-G935F - 32GB - Black Onyx (Unlocked) Smartphone with gear vr.